Spot silver followed gold and many other commodities such as copper yesterday, sharply lower ending as a wide spread down candle on the daily chart as the markets reacted to the surprise news from China of an interest rate rise of 0.25%. The reason for the sharp fall was that this was a surprise announcement and therefore unscheduled, something the markets dislike and reacted accordingly across the board as the dollar strengthened as a result. With China being the world’s largest markets for commodities any monetary tightening in an effort to slow down their economy will have an obvious knock on effect on prices which is what we saw yesterday. Indeed both copper and soybean also suffered in the commodity markets, with copper falling 2.5% on the day. However, under normal circumstances this item of fundamental news would simply have been absorbed by the markets. As such we can expect to see this as purely a short term pullback with buyers coming back into the market at lower prices (China included) and we can therefore expect to see a reinstatement of the bullish trend and a move back higher in due course. Indeed in this morning’s early silver trading session, spot silver has already regained much of yesterday’s losses and is trading at time of writing at $23.69, up from the low of $23.27. 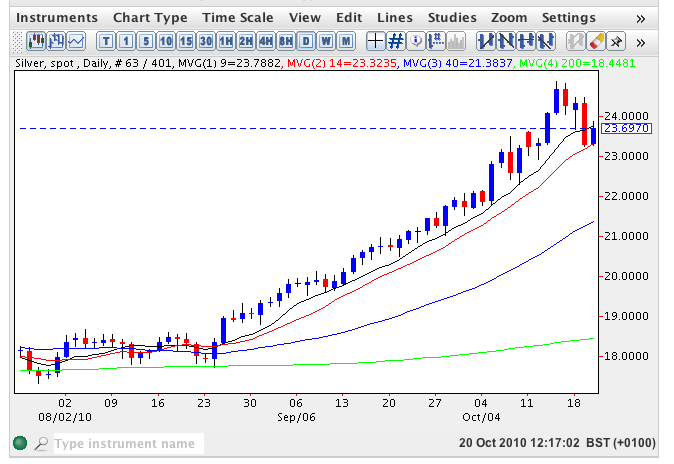 From a technical perspective it is interesting to note that yesterday’s low found strong support from the 14 day moving average suggesting once again that this is only a temporary reversal and for any resumption in the silver rally we need to see a hold above the 9 day moving average at $23.78 and thereafter a move past the high of last week, at $24.88 per ounce. All four moving averages remain firmly bullish and therefore we can expect to silver move towards $26 per ounce by the end of the year.